It's all about the Green this week. We've been lucky and had a few days of lovely sunshine recently (although as I write this now, it's hiding somewhere). I am thinking about what to take a photo of as I don't really want to take a photo of the grass as that's the first thing that came to my head. I just need to find something else Green and I don't know what. OK I will come back to this tonight and work it out. 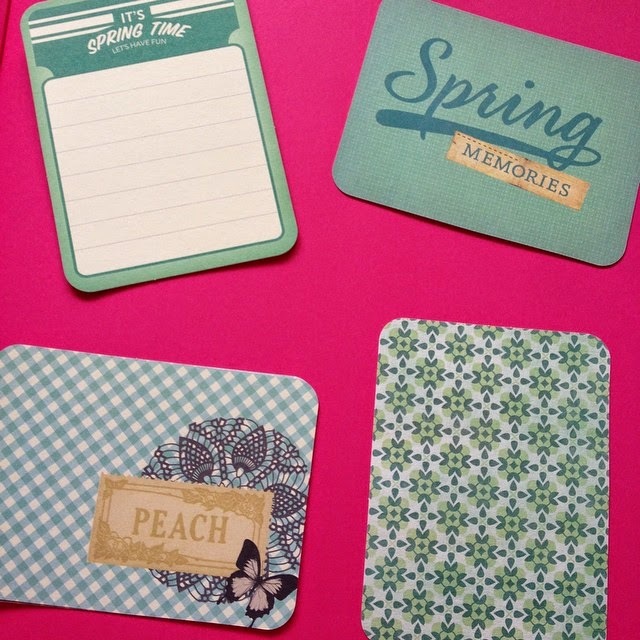 I have found these, I bought them the other day to put in my scrapbook that I am doing with Little Miss P. They are called Project Life cards, I saw them online and then found them in store. I just love the colour of them and what I can do with them, it's just a lot of cuteness on a bit of paper. I will have to show you what I end up doing with them at some point. All the cards are Green but different types of green... my favourite one is the one in the top right hand corner saying Spring Memories. It's just too cute. I hope you enjoyed my little blog post today. My Little Video on what's in my Dance Bag. Beautiful cards. I wish I was creative enough to scrapbook.